Smal-Stocki, Roman [Роман Смаль-Стоцький] – linguist, active in political affairs; born on 8 January 1893 in Chernivtsi (Ukraine; at that time – Austrian crown land of Bukovyna); died on 27 April 1969 in Washington DC, USA; buried in the Ukrainian Catholic Cemetery in Langhorne, Pennsylvania, USA. In 1911-1914 Smal-Stocki studied linguistics at the Universities of Vienna, Leipzig and Munich, and in 1915 gained a doctorate in Munich. After the outbreak of the First World War he became active in the Union for the Liberation of Ukraine and helped to organise educational and cultural activities for Ukrainians in the Russian army who were being held in prisoner-of-war camps in Germany. Towards the end of 1918 he was appointed diplomatic representative in Berlin of the Western Ukrainian People’s Republic (ZUNR). After the union of the ZUNR with the Ukrainian People’s Republic (UNR) in January 1919, he became a counsellor and, in 1921, ambassador at the UNR embassy in Berlin. He held this post until the closure of the embassy in March 1923, when he moved to Prague and became a professor at the Ukrainian Free University. After a short stay in Prague he came to the UK for a year, assisted by a grant from President Masaryk of Czechоslovakia, and was a visiting scholar at the School of Slavonic Studies, then part of King’s College, University of London, and at Pembroke College, University of Cambridge. He also acted as unofficial London representative of the UNR government in exile, thereby continuing the work undertaken in 1919-1921 by the London diplomatic mission of the UNR. While in the UK he established contacts with various influential figures. From the end of 1924 until the outbreak of the Second World War Smal-Stocki worked at the University of Warsaw, initially as assistant professor and later as full professor of Ukrainian linguistics. While in Poland Smal-Stocki held various posts in the UNR government in exile (which was based largely in Warsaw), including UNR envoy to the Polish government, Minister of Culture, Minister of Foreign Affairs and Deputy Prime Minister. He was also secretary of the Ukrainian Scientific Institute in Warsaw, founded by the UNR government in exile. 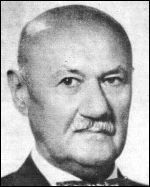 In 1926-1939 (and in 1946-47) Smal-Stocki was head of the Promethean League which comprised representatives of various non-Russian nationalities within the Soviet Union who were seeking independence. During his time in Warsaw Smal-Stocki established contacts with diplomats of various states, including the British Consul-General Frank Savery. In the 1930s he also made several visits to the UK, during which he gave lectures (for example, 26 June 1936 at the Royal Institute of International Affairs: "Aspirations of Nationalities in the USSR") and had meetings with Foreign Office officials. From 1934 he was a Full Member of the Shevchenko Scientific Society in Lviv. During the Second World War Smal-Stocki lived in Prague. At the end of the war, using his British contacts, he helped the commanders of the Galicia Division to arrange the division’s surrender to the British army in Austria to avoid capture by Soviet forces. After the war he moved to the American Zone of Occupation of Germany, from where in 1947 he emigrated to the USA. He became a professor of East European history at Marquette University in Milwaukee, Wisconsin. In 1949 he founded a Slavic Institute at the university and was its director until his retirement in 1965. From 1952 he was president of the Shevchenko Scientific Society in the USA, and in 1955 became head of the World Council of Shevchenko Scientific Societies. Smal-Stocki’s publications include over 150 works on topics including the Ukrainian language, literature, culture, history and politics, mainly in Ukrainian, English and German.